In separate hearings next week, the Assembly and Senate budget subcommittees that focus on health services will take an initial look at the Governor’s 2015-16 proposals for the state’s Department of Public Health (DPH). DPH is responsible for a range of public health activities, such as controlling infectious diseases, improving health outcomes for pregnant women and children, and ensuring the safety of food, drugs, and medical devices. DPH also licenses, inspects, and responds to complaints regarding health care facilities in California. Under the Governor’s 2015-16 proposal, state and federal funding for DPH ($2.66 billion) would nearly equal the inflation-adjusted spending level from 2007-08, the fiscal year during which the Great Recession began. (For purposes of comparison, our 2007-08 spending figure excludes bond funds spent through DPH as well as funding for the Drinking Water Program, which was transferred to the State Water Resources Control Board last year. In addition, DPH spending for both fiscal years excludes dollars that are provided as “reimbursements” from other departments.) However, while overall funding for DPH would be about the same as it was seven years ago, the mix of funds clearly has changed, as shown in the chart below. DPH now relies more on federal funds and state special fund dollars than it did in 2007-08. The Governor’s proposal assumes the state will receive $1.8 billion in federal funding for public health activities in 2015-16, up from $1.6 billion in 2007-08, after adjusting for inflation. The Governor also proposes to spend about $780 million in state special fund dollars through the DPH budget in 2015-16, up from an inflation-adjusted level of nearly $650 million in 2007-08. 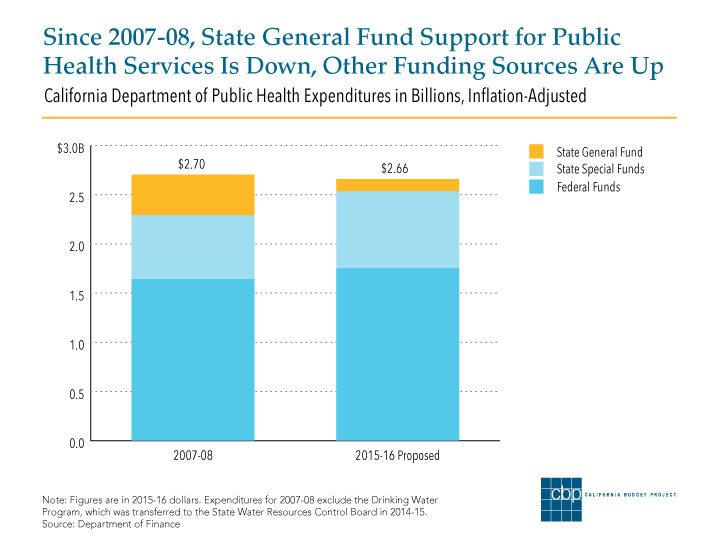 In contrast, DPH receives substantially less General Fund support than it did in 2007-08. That year, state policymakers provided approximately $410 million from the General Fund — after adjusting for inflation — for public health activities. As the recession worsened, policymakers cut General Fund support for DPH in order to help close large budget shortfalls. Those recession-era cuts largely remain in place under the Governor’s proposal, which would provide just $124 million from the General Fund to support public health services in 2015-16. It’s not clear to what extent — if at all — DPH has been able to shift federal funds and/or state special fund dollars in order to mitigate the impact of General Fund cuts. What is clear, however, is that several state-level public health initiatives that were eliminated in the wake of the Great Recession have not been revived. This includes the California Children’s Dental Disease and Prevention Program, which ceased operating after it lost General Fund support — roughly $3 million — in 2009. This program provided school-based dental services, such as sealants and fluoride rinses, to more than 300,000 primarily low-income children each year. Yet, despite the demonstrated need to improve low-income children’s access to dental care, the Governor’s proposed budget fails to restore state General Fund support for school-based oral health prevention services in 2015-16. For state lawmakers, the fate of this critical oral health program — and that of other public health services that were eliminated in recent years — shows the importance of examining not only what’s in the Governor’s proposed budget, but also what’s been left out. This entry was posted on Thursday, February 26th, 2015 at 4:22 pm and is filed under Health. You can follow any responses to this entry through the RSS 2.0 feed. Both comments and pings are currently closed.